Now, before we get started. Can everyone that has come here to read a review about an Ariana Grande-themed slot please turn around and exit immediately. 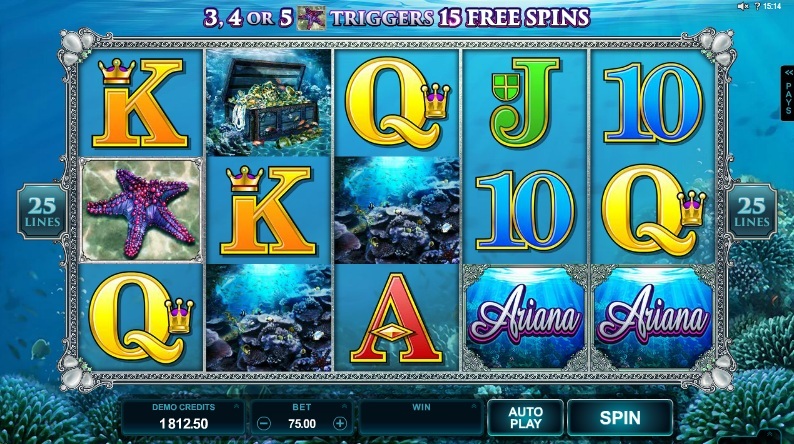 This Ariana slot is actually an aquatic-themed slot based on a mermaid princess from veteran slots developer Microgaming. Apologies to any disappointed fans of the pop star singer but we must commence. Ariana is a 5 reel, 25 payline slot that takes you underwater to the realm of the mermaids. The reels are set against a sea bed. It is possible to win a maximum jackpot win of up to 300,000 coins on this slot. The symbols present on the reels include Ariana herself, coral, sea dragons, treasure chests, and the regular 10-through-to-Ace symbols. Interestingly, a number of regular symbols can appear as Stacked Symbols on reel 1. Ariana herself can actually appear as a Stacked Symbol on any of the reels. During the base game, any full symbol stack on reel 1 will all matching high symbols on the remaining reels. This creates the opportunity to hit some decent wins during the regular spins. The Wild symbol is represented by the Ariana logo. This symbol substitutes for all other symbols, except for the Scatters, to help you complete any potential winning combinations that might appear across the reels on a spin. There is also a free spins bonus round and this is triggered if you hit three or more of the starfish Scatters on the reels on a spin. You will be rewarded with 15 free spins if this happens. The Ariana logo Wild also appears as a Stacked Wild on reel 1 during the free spins. Any wins triggered during the free spins will be multiplied by the total bet. It is also possible to re-trigger the free spins by hitting three or more starfish Scatters across the reels on a free spin. 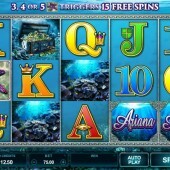 Ariana initially looks very similar to a number of aquatic-themed slots on the market. Examples of these include Novomatic's simple yet effective Dolphin's Pearl Deluxe slot and the free spins-orientated Deep Sea Treasure slot by Blueprint Gaming. However, the game changer on this slot is the Stacked Symbols. The fact the Stacked Wilds enter the field of play during the free spins only increases the action during the free spins and that makes for a thoroughly thrilling slot. Nice to see Microgaming adding a title to its portfolio that isn't considered to be run-of-the-mill.